Today we're delving into a topic that informs just about everything we do: scheduling. It's hard to find time for everything that needs to be done in a day. Whether you're a solo entrepreneur or run a yoga studio or a larger business, meetings make sure you do what needs to get done. It's the way we conduct business and connect with colleagues every day, so scheduling apps and platforms are super useful. In today's episode, Peter and I find the time to sit down and talk through pricing pages and strategies for the scheduling and calendar app market. We're facing off with Acuity Scheduling vs. Calendly to find out which product not only helps you plan your day but knows how to bill you for it too. 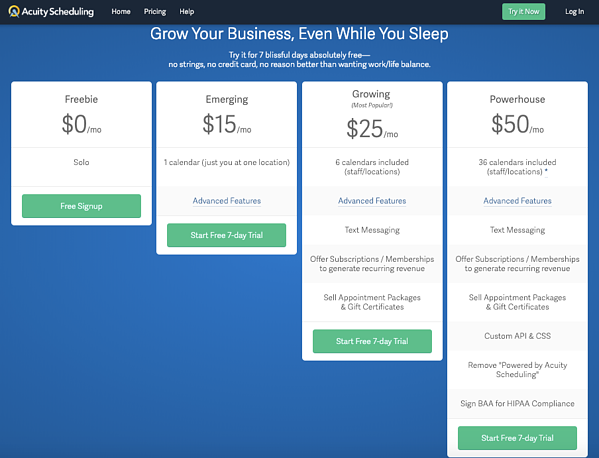 Pricing page design can tell customers a lot about how a company thinks about their product. From the value propositions to the structuring of pricing tiers—each selection tells us something about why each company thinks they're valuable. For Acuity Scheduling, it's the power of their functionality. 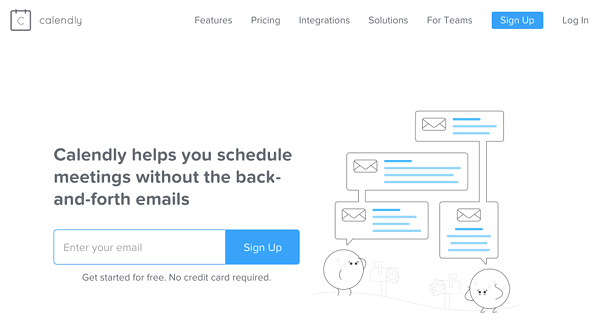 They have everything a customer might need to get things done, which is the basis of their value proposition—Acuity Scheduling is your online assistant, working 24/7 to fill your schedule. This really plays up the idea that a full schedule is what matters, because that's what is going to make customers money in the long-term. Acuity Scheduling is really positioning their brand as an assistant as opposed to just a way to schedule meetings. Calendly takes a different route with their Calendly helps you schedule meetings without the back-and-forth emails value proposition. It's all about saving time with Calendly. Their core functionality is right there in the name, and they play it up further down the page by calling out some of their more popular users. You end up having to really dig into their pricing page to pull out the feature offerings for each separate tier. There isn't enough visual difference between the check mark and the X. Each tier is clearly delineated from a visual standpoint, and customers can easily see what the major differences are between the four different packages. One of the most interesting differences is how each company structures their pricing. 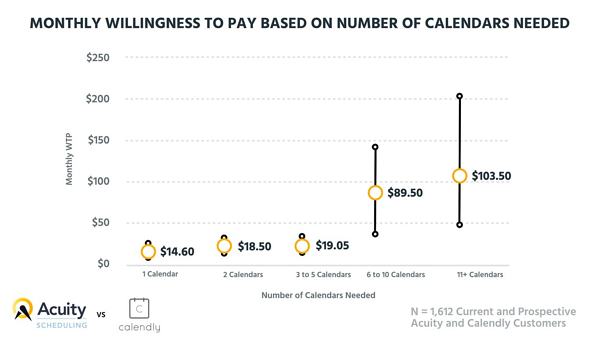 Where Acuity Scheduling built their tiers based on the number of locations, Calendly goes for a more traditional per-user pricing strategy. This makes them considerably more expensive than Acuity Scheduling, especially as the number of users/locations grows. Appealing to the right customer is one of the huge differences between the two companies we're looking at today. Where Acuity Scheduling definitely seems to be going after more of the small businesses, like a yoga or fitness studio, Calendly is looking up-market by targeting sales and marketing teams. We see this most in their value metrics. Calendly charges on a straightforward per-user basis and Acuity Scheduling charges based on location, which is much more of a nebulous concept. To help illustrate this, we surveyed 1,612 current and prospective customers of both brands and charted their willingness to pay based on the number of calendars needed. For one calendar, both companies are pretty much on the nose, meaning that neither is going to really have any issues at the bottom of the market. The willingness to pay goes up from $14.60 to $18.50, then again to $19.05 for up to five total calendars. 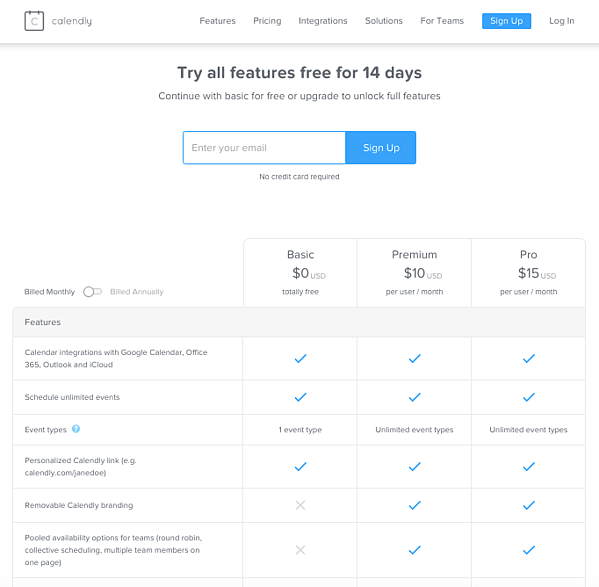 With Acuity Scheduling offering up to six calendars for $25 a month, you can see where this is going—Calendly already outpaces them with their premium tier clocking in at $60. That rift is only going to get bigger when we take a look at what happens in the 6 to 10 and 11+ Calendars segments of the market. 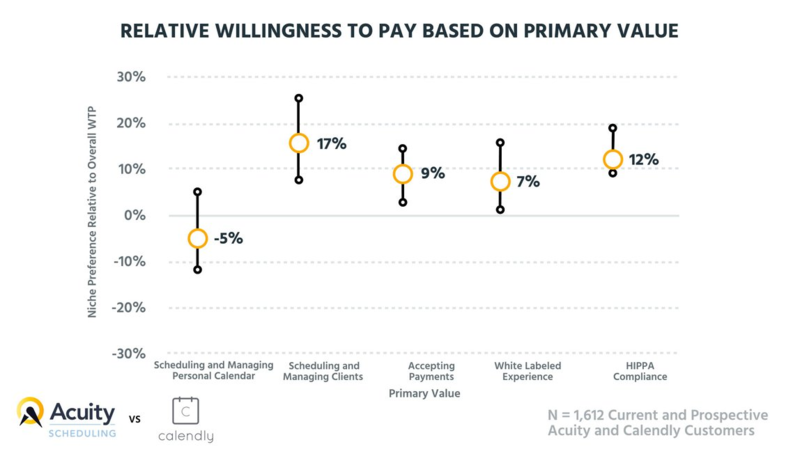 Calendly is set up above the average willingness to pay on their Premium tier and Acuity Scheduling is quickly losing out. Those ranges in the upper parts of the market are also scary for a company that targets smaller businesses, as Acuity Scheduling does, because it's way out of the realm of achievable for a yoga studio or a similar size company. Where both Calendly and Acuity Scheduling offer very similar products, they're going after drastically different parts of the market. That explains a lot of the differences we see in their pricing page design as well as their general pricing strategies, but ignoring that fact, both companies are still missing out a lot when it comes to feature differentiation. When we take a look at the relative willingness to pay based on what kind of value a customer places on certain features, lots of opportunities start to appear. Neither company is really optimizing on it either. For scheduling platforms, it's no surprise to see that Scheduling and Managing Personal Calendar has a -5% willingness to pay. That feature is core to their business and not something that people are going to want to pay extra for. What's interesting is that Scheduling and Managing Clients is sitting at 17% and swings almost up to 30%. Just a simple change from personal scheduling to client scheduling signaled a huge bump in willingness to pay. Now you shouldn't break that out into an Add-On or upsell, but it should be something that is featured prominently in the corresponding pricing tier. Same thing with Accepting Payments and White Labeled Experience. The only feature that would make sense to break out would be HIPAA Compliance. When we take a look at the relative preference for features based on overall willingness to pay, HIPAA Compliance is way out there in the left-hand quadrant with Ability to Collect Payments, Premium Support, and Customer API and CSS. These are features that, while not every customer feels a need to have them, those that do are willing to pay extra for it. We see Customer Branding over in the Differentiable Features quadrant, which is a loss for both companies as they don't really offer that option until the most expensive package. 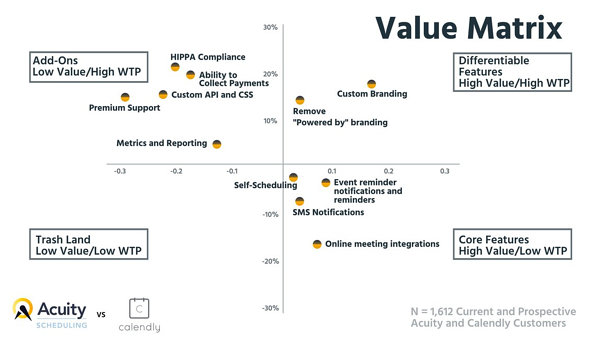 Both Acuity Scheduling and Calendly could benefit from a deep dive into how they're packaging their features, not only in terms of value to the customer but also in terms of potential expansion revenue. The upsell opportunities abound here, and neither company really does a whole lot to take advantage of that. Both Acuity Scheduling and Calendly need to have a better understanding of where their value is coming from. Each company is giving something away that could easily be turned into an Add-On or repackaging opportunity. When we took a look at the willingness to pay based on total number of calendars needed, both companies could easily break off the 6 to 10 and 11+ sections of the market into a more enterprise kind of package. As a user, both Peter and I would go with Calendly. That's not to say that Acuity is doing a bad job, quite the opposite in fact, but they're optimizing for a different kind of customer. We differ on investing. Peter would understandably go for Calendly because of their current pricing strategy and positioning. They're set up a bit better to win in the long-term, and you see their links out there in the market a lot. I'd go with Acuity Scheduling for no other reason than they're based in Wisconsin, and I have to give my Wisconsin family a shout-out from time to time.